ATLANTA, GA — Over President’s Day weekend this February, I traveled to Atlanta, GA to participate in the third annual College Club Swimming Summit. College Club Swimming (CCS) is a new governing body that was founded with the help of U.S. Masters Swimming. Now in its second year, CCS serves as a bridge between high school swimmers who didn’t or couldn’t swim on a varsity team in college and U.S. Masters Swimming. Much like USMS, CCS is led by an Advisory Board consisting of volunteers who are elected to two-year terms and serve as leadership on their local teams. Although CCS is backed by USMS, it is financially independent and almost entirely student-run, with just a small number of CCS alumni and USMS members sitting on the Advisory Board. USMS helps provide infrastructure for CCS to keep swimmers in the sport and aims to transition CCS members to USMS after graduation. This past year, CCS launched a wide variety of enhancements for its members. 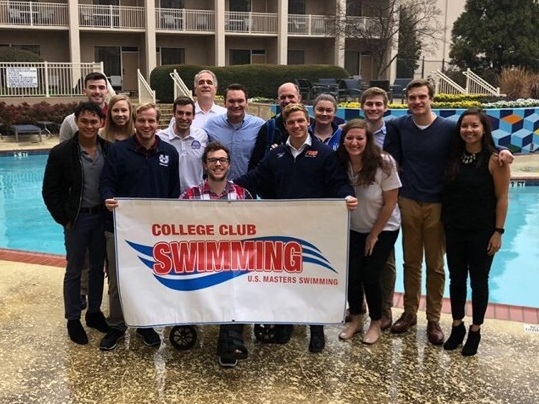 A new USMS-CCS bridge membership allows CCS members to swim in USMS sanctioned and recognized events while continuing to represent their CCS team in a new College Club Swimming LMSC. Additionally, CCS hosted its first Regional Championship series, with successful meets hosted at Rutgers University in the Northern region and Nova Southeastern in the Southern Region. CCS acquired its first sponsor in FINIS, the title sponsor for the CCS’s second national championship meet. Held at the Ohio State University from March 29-31, the 2019 FINIS College Club National Championships featured online meet entry through Club Assistant and drew 1,863 athletes from around the country. Online meet entry for all CCS meets is scheduled to become available to CCS Clubs in Fall 2019. At the Summit, Advisory Board members discussed a wide variety of topics, including best practices for clubs, inclusion and diversity within CCS, and amended rules of the governing handbook. For the first time, all three committees of the Advisory Board (Club Development, Rules, and Competition) met separately to discuss specific challenges and issues within CCS. It was an incredibly productive summit, resulting in improved organization and structure within the Advisory Board while promoting a low barrier of entry to CCS with the goal of maximizing CCS membership. In the New England area, there are currently about 10 CCS-affiliated clubs, including Harvard, Northeastern, UMASS, UVM, URI, CCRI, Brown, and UCONN, with several more intending to join for the 2019-2020 season. Jason is currently serving as an alumni-advisor to the CCS Advisory Board and is the chair of the CCS Rules committee. If you’d like more information about CCS, want to register a team, or have other questions, please contact him.